EARLY BIRD DISCOUNT ENDS 2/1/19! Our 2019 Annual Conference is a must for Federally Qualified Community Health Center leaders and employees as well as those interested in becoming an FQHC or LookAlike. CEOs, other administrative roles, CFOs other finance roles, CMOs and other clinical roles, COOs and other operations roles, CDOs, Human Resource and Workforce professionals, CACs and other outreach professionals, Quality Professionals, Health Center Board Members, Practitioners of all levels including primary care, dental, behavioral health and anyone who wants to learn more about, and get ahead in, the world of federally qualified community health care. Education Tracks of focus at the Annual Conference include Administrative, Clinical, Dental, Finance, Quality and Workforce/Operations. OACHC staff will be scanning attendees in and out of each session. 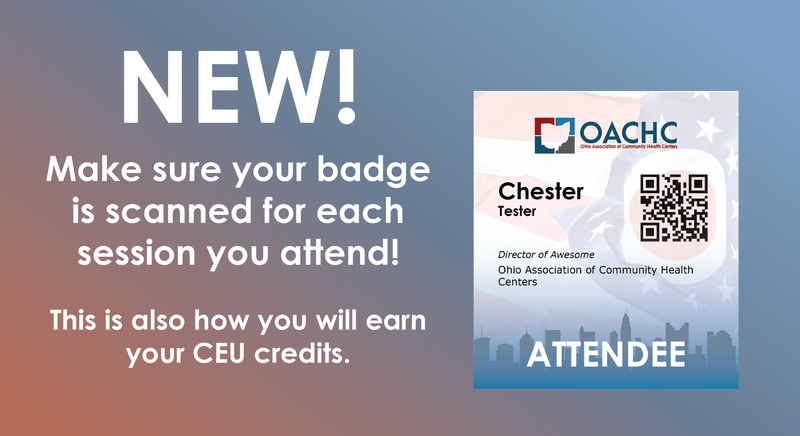 To receive your continuing education hours, you must have your badge scanned. Even if you do not need continuing education hours, we still need to scan your badge in and out of each session. A transcript of all the sessions you attended will be emailed to you at the end of the conference. This will serve as your continuing education certificate. 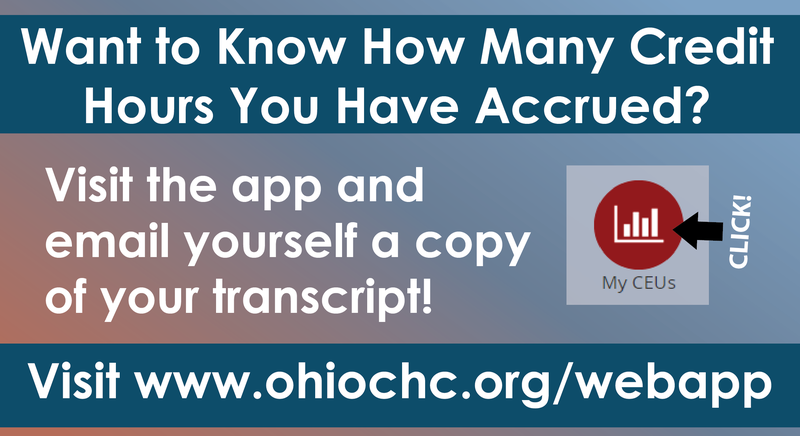 **Transcripts are also available in the Conference App and you can email these to yourself at anytime. Click on the My CEUs icon. All of the CEUs that you collected will be there. Click on the envelope icon and your transcript will be emailed to you. CME Credit | This conference is eligible for 10.5 hours of CME Credits. 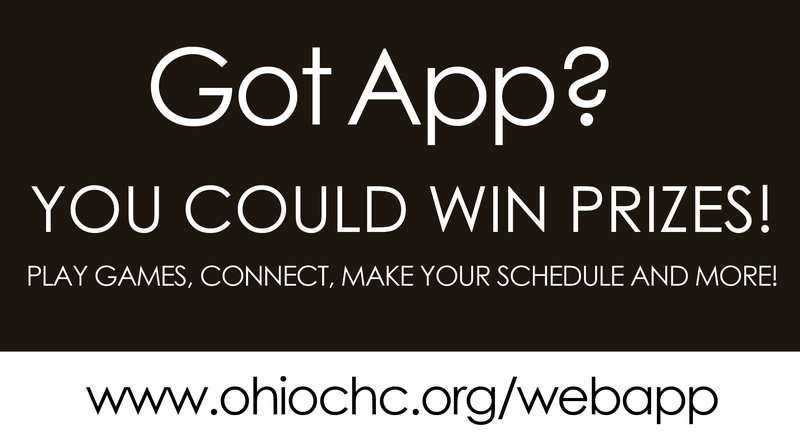 This Live activity, 2019 OACHC Annual Conference, with a beginning date of 03/04/2019, has been reviewed and is acceptable for up to 10.50 Prescribed credit(s) by the American Academy of Family Physicians. Physicians should claim only the credit commensurate with the extent of their participation in the activity. Behavioral Health Credit | This conference is eligible for hours of BH CEU Credits. • Cancellations received after 2/22/19 are not refundable. Substitutions are encouraged. “No Shows” are non-refundable.